Check out the subtle flames on this 1939 Ford Roadster convertible street rod! Imagine driving down the highway or cruising around town in this beauty! Are Your Looking for a Hot 1939 Ford Roadster Convertible Street Rod? If you answered “Yes” to that, then be sure to click on the image and check out this flamed street rod on eBay. The custom paint on this rod is Wedgewood blue with color-changing ghost flamework, and it features a ’39 Gibbons body and a ’39 Ford grille. The shine continues in the engine compartment, where the 300 HP 350 cubic inch V8 has a chromed water pump and a polished power steering canister, plus a polished Edelbrock carburetor and polished intake manifold. The shimmer doesn’t stop there, though, because the 100 amp alternator and the A/C compressor are also chrome, plus even the exhaust system is polished to a pristine shine. The customized interior features reclining bucket seats, leather covered door panels, and tilt steering wheel. The seller mentions that this car has received the first and second place Best of Show and Best Interior awards at several shows, and on top of it’s beauty, it’s not a trailer queen, it’s a reliable machine that you can drive anywhere. 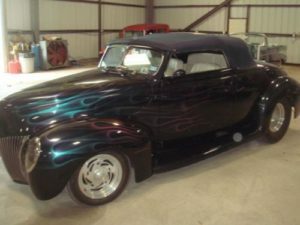 This is where I would normally add some general specs about the model of car I’m writing about, but since this is a customized street rod, I’m going to stop and encourage you to visit the listing, because the seller included so many details, I had to summarize quite a bit. Classic Cars Online US is proud to partner with eBay to bring you this information on the 1939 Ford Roadster Convertible Street Rod by showing you the ’39 Ford Roadster convertible street rod for sale in the photo. Part of the reason Classic Cars Online US exists is to help connect classic car buyers and sellers, and we’ve added several ways for you to connect, but first, be sure to visit the Classifieds page if you’re in the market to buy or sell classic cars such as the iconic 1939 Ford Roadster.